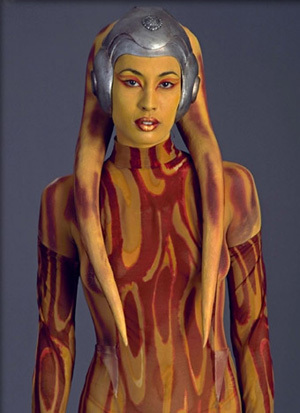 Twi'leks are tall, thin humanoids with skin pigment that spans a rainbow of colors. Their most distinctive feature is a pair of shapely prehensile tentacles that grow from the base of their skulls. Few things are as graceful as a female Twi'lek in motion. This beautiful image has forever doomed generations of young Twi'leks into servitude, as the wealthy and corrupt have taken to brandishing Twi'leks as badges of prestige. Twi'leks live in clans which are governed by a five-member group known as a head clan. The members of the clan append their clan name to their given name. The Twi'leks use their head-tails, or lekku, when they speak their native tongue of Twi'leki. The language is a combination of physical and linguistic communication, with spoken word being supplemented by subtle twitches and moves from the lekku. Twi'leks are omnivorous, eating cultivated molds and fungi, as well as meat from bovine animals called rycrits. They have a sly disposition of patience and adaptability. As the Twi'leks learned from evolving through the harsh storms of their world, strength does not always come from confrontation. Often, as a Twi'lek proverb says, "one cannot defeat a heat storm, one must ride it." The Twi'leks have developed an industrial-level technology, with windmills and turbines providing power to their homes and industries carved into the Ryloth mountains. Each city complex is autonomous, and governed by a head-clan. Having no native space-faring technology, the Twi'leks instead rely upon neighboring systems (such as Tatooine), pirates, smugglers, and merchants for their contact with the galaxy. The planet Ryloth provides the galaxy with ryll, a powerfully addictive recreational substance and mineral. Twi'leks have adapted to the criminal attention brought to their world by selling their own people into slavery. This way, the Twi'leks have something to give the criminals, and still retain control of the ryll mines. 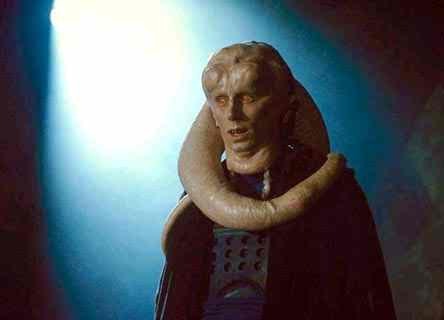 Unfortunately many Twi'leks, mostly female, bare the brunt of this despicable trade-off. During the Galactic Civil War, the Twi'leks remained neutral, not wanting to become involved in the struggle. They viewed the Rebel Alliance and the Empire as two heat storms that would eventually dissipate. Only after the storm had cleared, could the opportunist Twi'leks emerge and prosper.